On a Sunday morning, come and join us…. All free of charge, and in a relaxed family atmosphere! 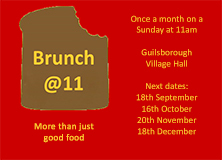 The next dates for Brunch@11 are October 15th, November 19th, December 17th. Our 2018 dates are: January 21st, February 18th, March 18th, April 15th.